Successfully Added Motion Detection LED Light - 3 Meter 120 Degree PIR Sensor, 25 Lumen, 10 LED, Easy Installation, Up To 80,000 Hours Lifespan to your Shopping Cart. The Forecum L802 PIR motion detection light is the perfect addition to any home. for use in cupboards, closets, stairwells, bedrooms bathrooms and anywhere else you need easy convenient lighting. Using an advanced PIR technology this LED light is activated when a body's radiant heat is detected. The sensor covers a 120 degree angle and is sensitive enough to work over 3 meters so when the ambient light is low the light will automatically activate when anyone walks in front of it. Once triggered the light will remain on for 15 seconds so you can enjoy instant lighting whenever you need it. This LED light is quick and easy to install with no tools, screws or wires required. Simply stick it anywhere you want with the magnetic 3M adhesive tape, meaning that installation and maintenance is hassle free. With 10 super bright LEDs this energy saving light emits 25 lumens of soft light so you won't be blinded by any bright glare when it's activated. 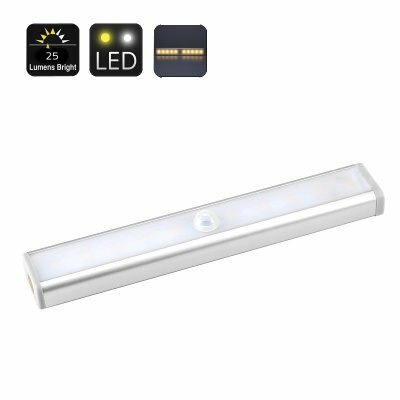 Having a long operating life of up to 80,000 hours this super bright low powered LED light can last up to 100 hours from 4 AAA batteries making it the environmentally friendly way to bring intelligent lighting to any room of your home of office. This Focrum LED light comes with a 12 months warranty, brought to you by the leader in electronic devices as well as wholesale LED lights and gadgets..